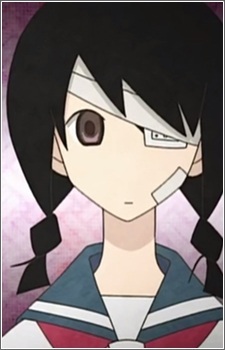 A girl who is always heavily bandaged, and assumed by most people to be the victim of domestic violence. She has a fetish for pulling animal tails, and her injuries are actually caused by irate animals reacting to having their tails pulled by her. She works at the local zoo to indulge her obsession, and keeps an extensive collection of mounted animal tails at her home. She has differently-colored eyes because of a transplant when she was younger, but this feature is not obvious because her transplanted eye is usually covered by an eyepatch or bandages. Her name is derived from kobushi abiru, which means "to bathe in fists". She has admitted having put on bandages even when not injured for the sake of attention.